I wish somebody in Stryper’s circle or record label Enigma thought that way in 1988. Just because you have an incredible range and clean voice, does not mean you need to shatter glass with it, and it also doesn’t mean it’s best used by creating heavenly, angelic harmony parts. Just because you had a successful prior album (To Hell With the Devil) does not mean softening your sound on your next album will equal more success. If a record company executive said, “If you write more commercial songs and record them with less guitars and more keyboards you’ll get on the radio,” that doesn’t mean they were right. It’s easy to put on my 20/20 Hindsight Goggles and pick apart In God We Trust, the highly anticipated third album by Stryper. It’s like shooting ducks in a barrel. 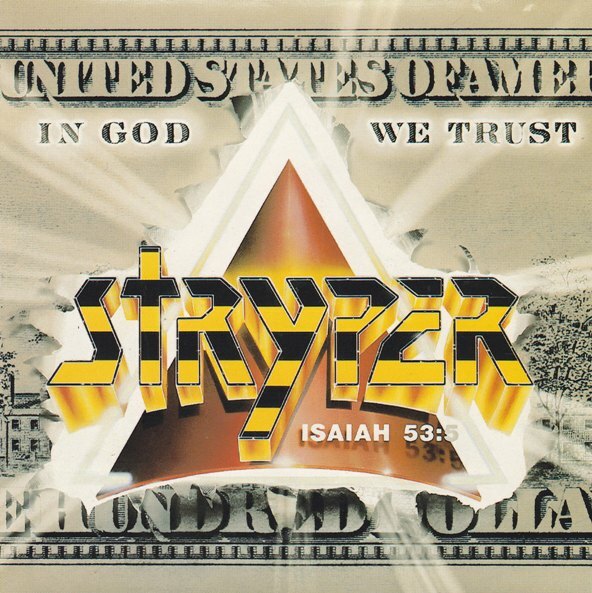 Whatever choices Stryper or management made, In God We Trust is their most dismissed album by fans and critics alike. It was a perfect storm of bad decisions. Stryper themselves, dissatisfied with the original title track, later re-recorded it as “IGWT” for their heavy reunion album Reborn. That modern, detuned version blows away anything on this album. The first thing that strikes me about “In God We Trust” (the original, not the remake) is the prominence of the angelic harmonies. It sounds like a cross between a choir and a toothpaste commercial. Michael Sweet is an incredible vocalist, this is true, but I maintain that it took him a few albums to really find his voice’s character. Aside from the harmonies, “In God We Trust” is actually quite a heavy speedy metal track. Drummer and “visual timekeeper” Robert Sweet is a relentless beast. “Always There For You” was the saccharine-sweet lead single. Sweet employed his trademark of hiding his religious message behind a neutral, benign lyric. “I’m always there for you, I’ll always stand by you, when the world has closed the door and you can’t go on anymore, I’m always there for you.” It sounds like the directive was, “Write us another song like ‘Calling on You’ but more commercial so we can make an expensive video.” Then the next song “Keep the Fire Burning” almost sounds like they said the same thing, except about “Free”. Continuing with the theme of re-writing the past hits, “I Believe In You” is “Honestly, Part II”. It is sunk completely by the too-sweet Sweet harmonies. This sounds like something my mom would listen to! Heavier is “The Writing’s On the Wall” but I find the lyrics irritating. “The God that Stryper serves is no delusion!” As a Christian myself, I recognize that people don’t like that kind of thing in their faces all the time. That is a personal preference and I believe there is room for everybody’s opinions. A song like “The Writing’s On the Wall” doesn’t strike me as inviting in its message, but the opposite. The second side of In God We Trust is commenced with the terribly titled “It’s Up 2 U”. This is actually one of the better songs even though it’s one of the most commercial. The harmonies here are lower are thicker, and it turns into a bit of an anthem on the chorus. Then “The World of You and I” starts with potential as an acoustic ballad, but transitions into a sickly-sweet chorus that I can’t decide if I like or not. For glass-shattering high notes, just skip to 2:10! For really bad songs, check out “Come to the Everlife”. This is like bad Quiet Riot circa QRIII. “Lonely” is morose but not terrible. It makes the album lean terribly ballad-heavy and soft, however. The keyboards and harmonies overpower the song rendering it somewhat limp, but with a smooth and classy beat. Thankfully “The Reign” closes the album on a heavy, Maiden-esque note. It’s a menacing but preachy metal song. Wait… Red from That 70s Show was the president of the Federation? You got it man — same guy. But well before the 70’s Show. I’m thinking they put quite a bit of trust in hairspray too. There goes the ozone layer! Bye bye Ozone…Stryper were definitely a repeat offender. And God spake unto Stryper saying thou must smite the ozone layer unto death, for it is the devils work. The hairspray levels are a sin for sure. Hahaha STILL WITH THE HAIR! Oy vey. Their hairstylists made a lot of money. Songwise – awesome album. Sure, many songs are sister songs to many of the tunes on To Hell With The Devil, but it doesn’t matter, they’re still great. Production wise – crap album. But this was 1988 and lots and lots of great records suffered from crap productions – Crazy Nights (Kiss), Intuition (TNT), The Ultimate Sin (Ozzy) and The Final Countdown (Europe), to name but a few. Michael Sweet said in his book that he think that Come To The Afterlife is the worst song Stryper ever recorded. I think it’s ok. He also said that the tour for IGWT was theonly one where they had ever used backing tracks live to be able to reproduced all the big vocal harmonies and backingvocals that was on that album.